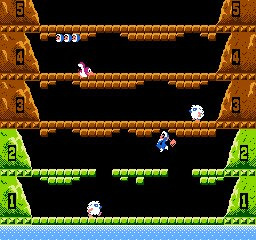 Ice Climber is another classic NES title for the Virtual Console — and thankfully, it's decent enough to be worth considering for download. Ice Climber is a fantastic little game, if somewhat basic. Graphically it's exactly what you'd expect an 8-bit game from 1985 to look like — simple. The premise of the game is pretty bizarre. A giant condor has stolen your vegetables, and you've got to climb a mountain to get them back. In the single player game, you play as Popo, a boy armed with a hammer and an impressive jumping ability. 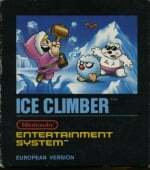 You use your hammer to break through layers of ice and then jump to the next plane. The stages consist of eight levels that scroll vertically as you progress from level to level, and if you fall where there's no platform, you die. The game starts off easy enough, but you quickly find yourself fending off such creatures as yetis and birds with your hammer, avoiding falling icicles, and jumping on moving clouds to advance to the bonus stage that lies atop each level. 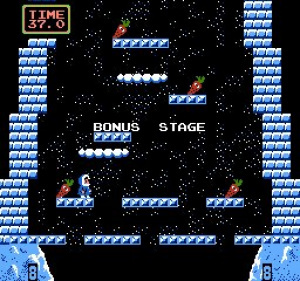 Once you reach the bonus stage, you're given 40 seconds to collect vegetables and make it to the top, where you then must jump and grab the talons of the condor that flies overhead. As with many of the NES games we've seen so far on the VC, the suitability rests on two key factors — if you were a fan of the game back in the day then you will probably want to play this. If you weren't, then we'd recommend that you try some of the other games out there before buying this. I'm sorry, but I feel that's way too low. It has really fun gameplay, and the multiplayer is great. The levels have lots of variety too. I agree with Ferret75 that it's scored a bit low. While it's not a great, must have game by any means it has that certain Nintendo charm that the mid 80's games are known for. I'd go 7/10 myself. One of my favorite NES classics of all time! The music is intoxicating, the levels are tricky and the charm and amount of levels totally justify the cost. This is going to be released as free this Thursday for early 3DS adopters, but I would have easily paid for it. Great game! I give it a 9/10. 5 is way too low!! 2007 was a very different time, I guess. There's no explanation for why it got 5/10. The review makes no mention of what is good or bad about the game. ^ Whats good about it: Decent music, on-and-off style gameplay for short bursts. Whats bad about it: Weird jumping mechanic (falling though bricks a lot of the time), large difficulty curve in the levels, repetitive gameplay with little new elements introduced as game progresses, close to impossible bonus rounds allowing for almost no error, slow scoring tables slow game down a lot, and weird unexplained game storyline. I'd give it a 6 or 7. Maybe, just maybe an 8 since i got it for free and my dad has crazy nostalgia when he plays in on my 3DS. This game is way overated, I give it an 8/10, I really like it. I'll pass and get Mega Man 2 instead. This is a bad game. I don't understand why people have fond memories of this. Baffling. Edit: 7/10? 8/10? Really? And then we complain about inflated grades. Funny.